The Apple iPhone 5's come in different boxes matching the color of the device. The retail package otherwise is a pretty standard affair at first sight. You get the usual set of accessories in the box: a wall mount plug, a USB cable that you need to use for both charging and computer tethering and a pair of headphones. There's also the pin, you can use to eject the nano-SIM tray. However, upon closer inspection, you'd notice that there are some serious differences compared to what you got with an iPhone 4S. For one, the iPhone 5 comes with the new EarPod headphones, which while awkwardly looking, produce way better sound than the old set Apple used to supply with its smartphones. We are not as convinced about the shape of the EarPods and how it was "designed to fit your ears best", but the fact remains that only extreme audiophiles will be tempted to move away from them and fork out the cash for pro-grade headphones. As for the other change in the retail box - the USB cable now ends on the new Lightning connector that the iPhone 5 employs. Depending on how you look at it, this can be either good news or bad news. The new port is faster, better looking and easier to use as it's symmetrical (which means you can insert the cable either way). On the other hand, none of your old accessories and cables will work with the new phone unless you get a load of those expensive adapters. And we guess even an adapter won't be able to save now obsolete docking accessories. 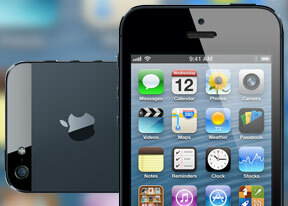 The very shape and size of the Apple iPhone 5 are a key selling point. At 123.8 x 58.6 x 7.6 mm, the latest generation has grown by less than a centimeter compared to its predecessor, but has shed nearly 2mm off its thickness. Now, add the fact that the weight is just 112 g, which is a good 28g lighter than the iPhone 4S and you start to understand why Apple is so proud of its achievement. They've managed to fit more in a shell that's about 13% more compact (we are talking overall volume) and 20% lighter than before. We do think a major redesign was in order - not because there was anything wrong with the iPhone 4, and 4S, but because it would've been a statement. Apple needed to show that its commitment to courage and creativity is unshaken by the huge loss of leadership and inspiration. The iPhone 5 failed to deliver that brand new design we were hoping for but, to be honest, photos really fail to do the handset any justice. But let's take it one step at a time. The front panel is virtually identical to the iPhone 4 and 4S. True, the screen has been stretched a bit vertically but, when looked head-on, the iPhone 5 is hard to tell apart from its predecessors. What prevents us from giving full points to the iPhone 5 is the amount of unused space at the front. It's the use of space that sets high-end products apart from the rest, but the iPhone 5 has acres of unused glass at the top and bottom. Need proof that a better job could be done? The Motorola Razr M has virtually identical surface to the iPhone 5 and yet fits a 4.3" screen of the same aspect ratio. Turn to the sides though and things start to look brighter. The iPhone 5 may not be the slimmest smartphone as we were told, but it's still doing better in that regard than any of its direct rivals and its predecessor. The handset's slim metallic profile is looking really great, and now that the ugly hole of a 30-pin connector at the bottom is gone, there's virtually nothing to spoil it. Finally, we make it to the back, which is really the most delicious part of the iPhone 5. Both the White&Silver and the Black&Slate iPhone 5 versions use a two-tone design, and the back blending metal and glass looks splendid. There isn't even a shadow of a doubt as to which iPhone 5 version we prefer in terms of pure aesthetics. The black one looks magnificent. The downside is it's incredibly easy to get all greased up and once you are there, cleaning it takes a herculean effort. The white one on the other hand, looks less impressive at first, but manages to maintain its unspoilt looks a bit longer. That said, even a fingerprint-covered iPhone 5 still looks better than many all-plastic Android flagships, so Apple retains its lead here. What we are not so sure is how happy will you be with your iPhone 5's design when it gets scratched. And that leads us to the main grudge we have with the new iPhone - unless you take the utmost care, it will get scratched. The anodized aluminum chipping issues are already well documented and we are just a week into the iPhone 5's availability. Simply put, the material Apple selected is not durable enough. The company tried to defend itself, saying that scratching is a normal for anodized aluminum bodies, but that's not quite true. We have a Nokia N8 that's been tossed around the office for nearly two years now, and it only has few scratches and shows minimal wear. We've seen three-day old iPhone 5 units that look worse.